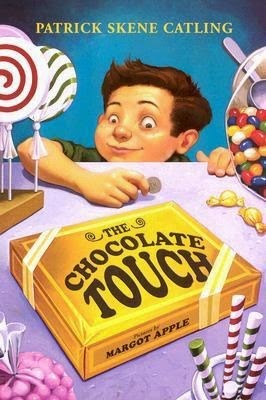 The Chocolate Touch is about a boy named John Midas. John spends all of his allowance on chocolate. He loves chocolate more than anything else in the world. One day, when he is walking to his friend's house, he finds a special coin. He decides to take a different turn to his friend's house. He then finds a candy store and takes a look around. He buys a big box of chocolate and sneaks it into his room. That night, he opens the box and finds out that there is only one piece of chocolate in it. He eats the chocolate anyways. The next day, his toothpaste and breakfast taste like chocolate! He tells his dad and his dad discovers John has the chocolate touch. Everything he puts to his lips will turn to chocolate. How could this go wrong? I thought this book was kind of funny because John ate his gloves and the toothpaste because they were chocolate. At first, I thought the parents were playing a kind of trick on him, but at the end, I figured out that they weren't. I also like how that when he eats all that chocolate, he actually learns a lesson not to be so greedy.